1. EVEN KOKO THE GORILLA LOVED HIM. Most people have heard of Koko, the Stanford-educated gorilla who could speak about 1000 words in American Sign Language, and understand about 2000 in English. What most people don't know, however, is that Koko was an avid Mister Rogers' Neighborhood fan. As Esquire reported, when Fred Rogers took a trip out to meet Koko for his show, not only did she immediately wrap her arms around him and embrace him, she did what she'd always seen him do onscreen: she proceeded to take his shoes off! 2. HE WATCHED HIS FIGURE TO THE POUND. 3. HE SAVED BOTH PUBLIC TELEVISION AND THE VCR. Strange but true. When the government wanted to cut Public Television funds in 1969, the relatively unknown Mister Rogers went to Washington. Almost straight out of a Capra film, his testimony on how TV had the potential to give kids hope and create more productive citizens was so simple but passionate that even the most gruff politicians were charmed. While the budget should have been cut, the funding instead jumped from $9 to $22 million. Rogers also swayed the Supreme Court to allow VCRs to record television shows from the home. It was a cantankerous debate at the time, but his argument was that recording a program like his allowed working parents to sit down with their children and watch shows as a family. 4. HE MIGHT HAVE BEEN THE MOST TOLERANT AMERICAN EVER. 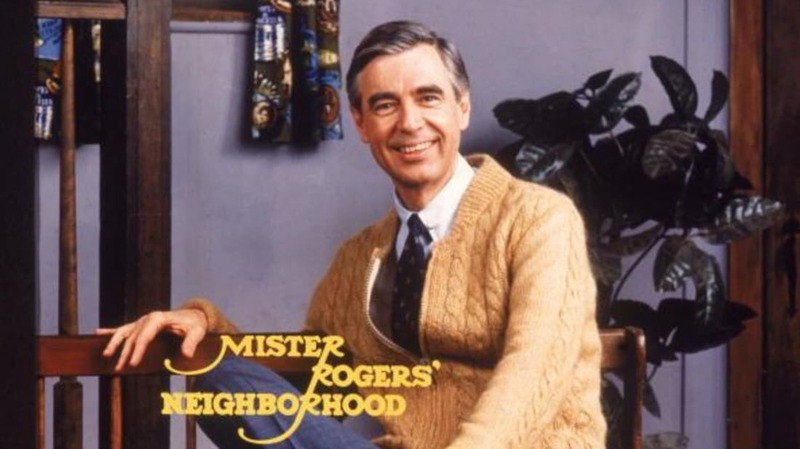 Mister Rogers seems to have been almost exactly the same off-screen as he was onscreen. As an ordained Presbyterian minister, and a man of tremendous faith, Mister Rogers preached tolerance first. Whenever he was asked to castigate non-Christians or gays for their differing beliefs, he would instead face them and say, with sincerity, "God loves you just the way you are. " Often this provoked ire from fundamentalists. 5. HE WAS GENUINELY CURIOUS ABOUT OTHERS. Mister Rogers was known as one of the toughest interviews because he'd often befriend reporters, asking them tons of questions, taking pictures of them, compiling an album for them at the end of their time together, and calling them after to check in on them and hear about their families. He wasn't concerned with himself, and genuinely loved hearing the life stories of others. Amazingly, it wasn't just with reporters. Once, on a fancy trip up to a PBS exec's house, he heard the limo driver was going to wait outside for 2 hours, so he insisted the driver come in and join them (which flustered the host). On the way back, Rogers sat up front, and when he learned that they were passing the driver's home on the way, he asked if they could stop in to meet his family. According to the driver, it was one of the best nights of his life—the house supposedly lit up when Rogers arrived, and he played jazz piano and bantered with them late into the night. Further, like with the reporters, Rogers sent him notes and kept in touch with the driver for the rest of his life. Literally. He couldn't see the color blue. Of course, he was also figuratively color-blind, as you probably guessed. As were his parents who took in a black foster child when Rogers was growing up. 7. HE COULD MAKE A SUBWAY CAR FULL OF STRANGERS SING. Once while rushing to a New York meeting, there were no cabs available, so Rogers and one of his colleagues hopped on the subway. Esquire reported that the car was filled with people, and they assumed they wouldn't be noticed. But when the crowd spotted Rogers, they all simultaneously burst into song, chanting "It's a beautiful day in the neighborhood. " The result made Rogers smile wide. 8. HE GOT INTO TV BECAUSE HE HATED TV. The first time he turned one on, he saw people angrily throwing pies in each other's faces. He immediately vowed to use the medium for better than that. Over the years he covered topics as varied as why kids shouldn't be scared of a haircut, or the bathroom drain (because you won't fit! ), to divorce and war. 9. HE WORE SNEAKERS FOR A REASON. His trademark sneakers were born when he found them to be quieter than his dress shoes as he moved about the set. 11. HE COMPOSED ALL THE SONGS IN THE SHOW. 13. MICHAEL KEATON GOT HIS START ON THE SHOW AS AN ASSISTANT. ...helping puppeteer and operate the trolley. Queen Sara is named after Rogers' wife, and the postman Mr. McFeely is named for his maternal grandfather who always talked to him like an adult, and reminded young Fred that he made every day special just by being himself. Sound familiar? It was the same way Mister Rogers closed every show. I can't sign off with out citing Tom Junod's wonderful profile of Fred Rogers and his obituary for him. They are two of the most lovely pieces I've (re)read in a very long time. Our researcher Kara Kovalchik also deserves credit for digging them up on an internet archive located here.